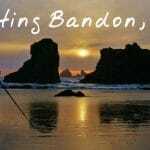 Another fun-filled snowbirding season is winding down and we now head for our summer haunts on Vancouver Island, BC. 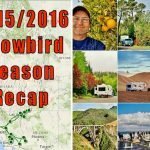 I thought it would be a good time to look back at the places we visited and pick out my Top 10 Campsites from 2013/14 Snowbird Season. 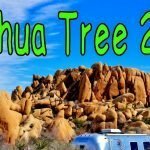 Of the ten that I picked out only two of them had any sort of hookups, the rest we were on our own boondocking it. 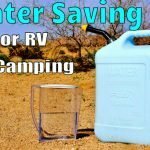 I think you’ll see by the following images that by giving up the conveniences of the RV parks you can enjoy some amazing places. 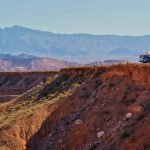 For those that don’t know BLM stands for Bureau of Land Management. 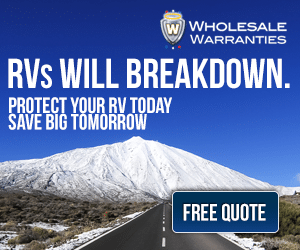 They are the agency responsible for many of the dispersed camping sites listed below. This well maintained park is usually our first big stop of the season and we generally book two weeks here. It’s our favorite in the Thousand Trails system. After the long journey down from from Canada it’s nice to enjoy some leisure time in a resort type park. They have a nice big pool, hundreds of date palms over head and the location is great, Palm Springs! Another perk with the park is they allow free rig washing, hard to find in the desert. 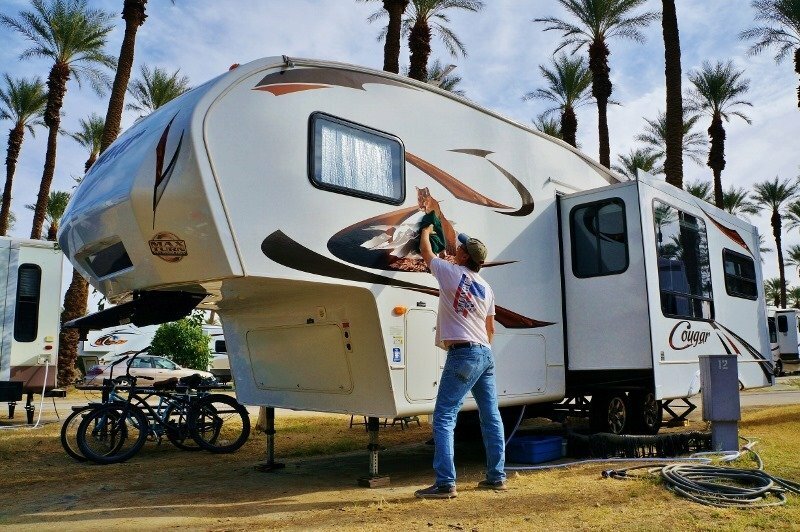 So I take the opportunity to give the truck and trailer a good wash and wax and prepare it for the months of desert sun and dust to come. 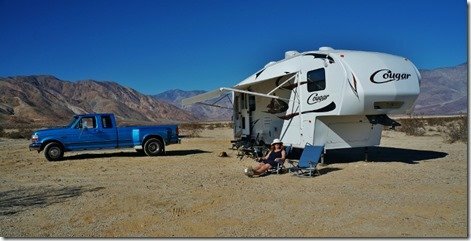 This was our third visit to the Borrego Springs area and more specifically the free boondocking land around Clarke Dry Lake. The land is super sparse and dry but somehow in it’s complete look of desolation it is beautiful. 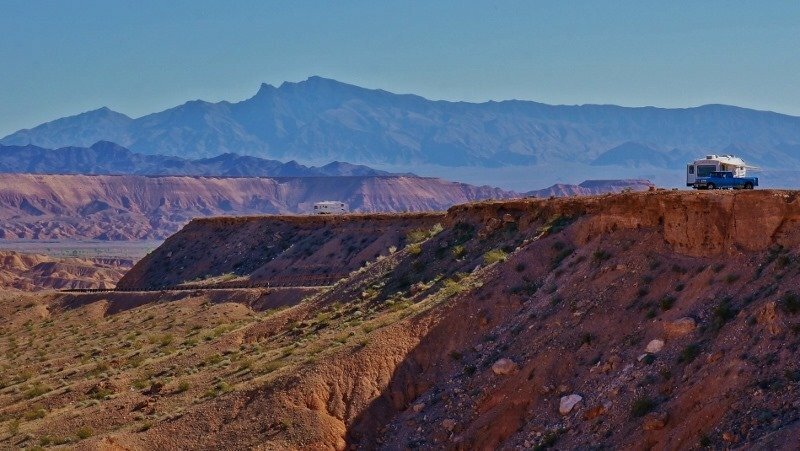 We especially love the surrounding mountains and hills which near sundown light up and a myriad of shadows are created. It is also away from large city lights so a great place to site back and star gaze the evening away. 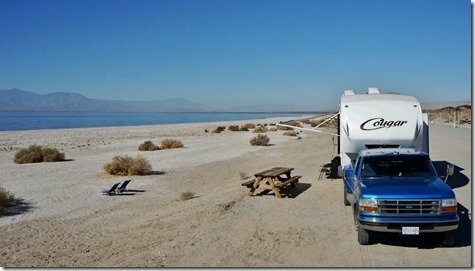 Here we are camped at Corvina Beach campground on the shore of the Salton Sea. 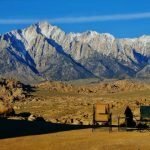 This is one of the most unique campsites I’ve been to. It looks like a nice white sandy beach but is actually millions, maybe billions or trillions of barnacles. We loved sitting out in the warm evenings watching the sunset over the salt water lake as pelicans and other shore birds floated and flew by. It was so out of place in the desert and that makes it very special. 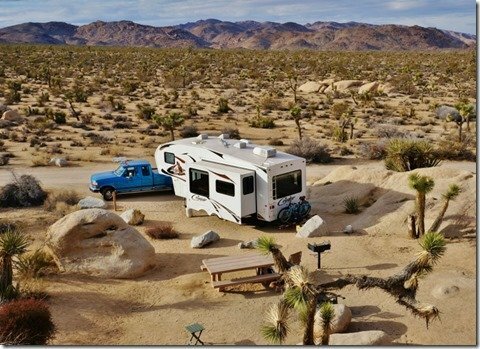 What can I say Belle Campground in Joshua Tree NP rocks! 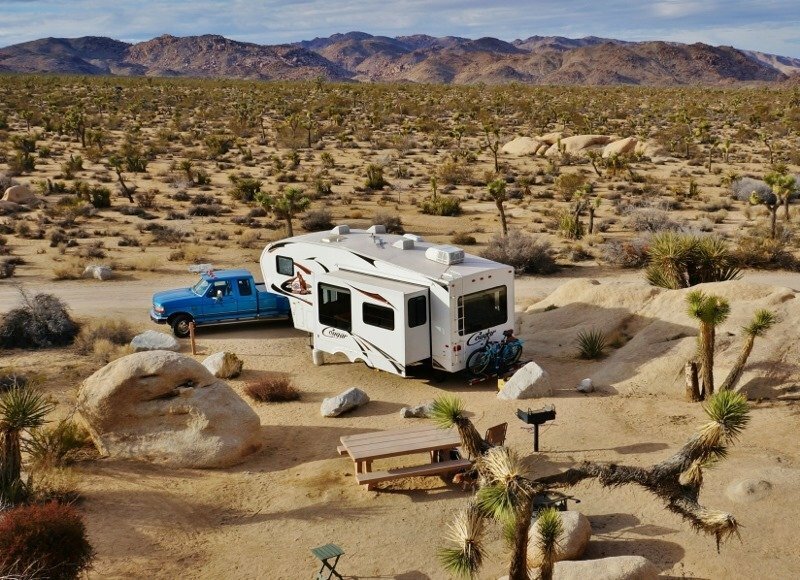 The campsites are nestled in around giant rounded boulders with the funky Dr. Seuss like Joshua Trees all around. It so surreal it almost seems like a fake movie set or something. I half expected to find the boulders are really Styrofoam and the trees plastic. 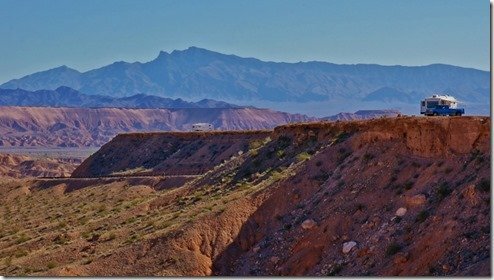 Nothing terribly note worthy about the Quartzsite landscape except it is hard packed, flat and home to thousands of RVs in the winter months. 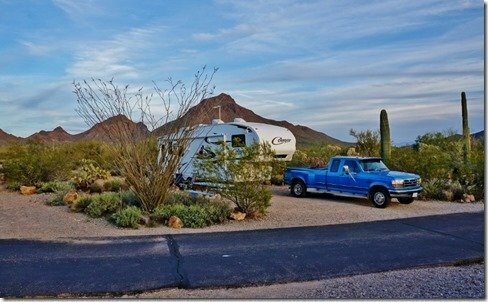 The best thing about Quartzsite camping is your part of the largest gathering of RVing folks on the planet. 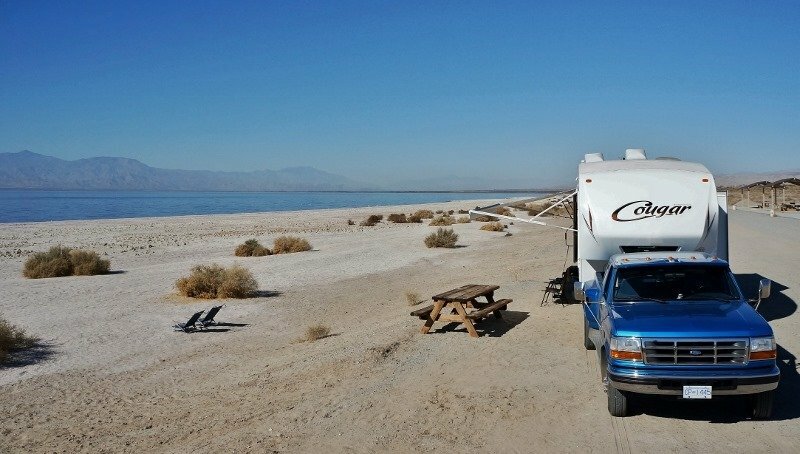 It’s a place to expect the unexpected like floating candles lighting up the night sky, distant Elvis music throbbing away or waking up to see a hot air balloon float by the rig. Just a few of the things seen and heard this year at the Plomosa Road BLM. 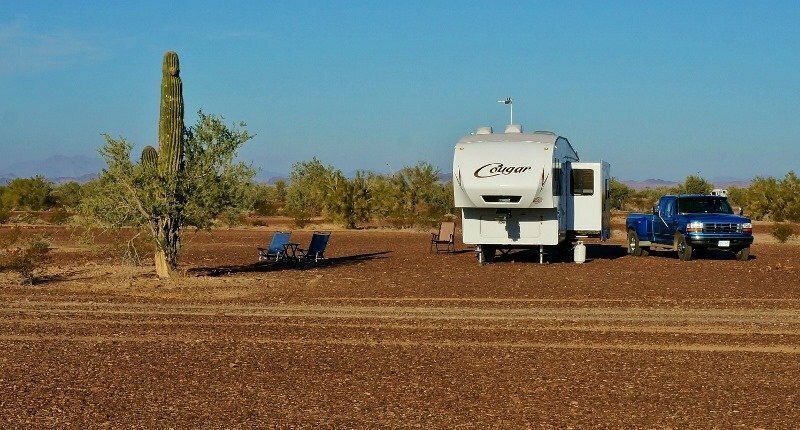 Gunsite Wash is located way down in southern Arizona near Organ Pipe National Monument. The neat thing about this desert region is how lush it is. With the right temps and rainfall it produces a huge concentrated variety of cactus and desert plants. They call it the green desert. 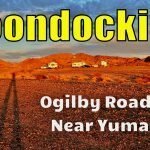 This BLM contained a friendly laid back collection of RVers and funny enough although it was one of the most remote stops we made it ended up being very social. We met several folks from Vancouver Island camped there and literally ran into Nina and Paul from the Wheeling It blog (one of my favorites) while out hiking one day. 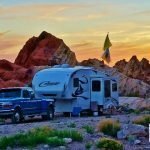 There is a reason they have a 7 day stay limit at Gilbert Ray campground. It’s so damn beautiful people would never leave. 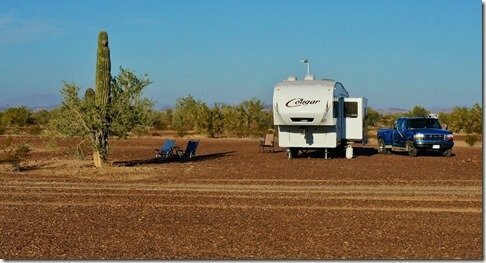 Set right in amongst hills covered with giant Saguaros this little county park is a real gem. 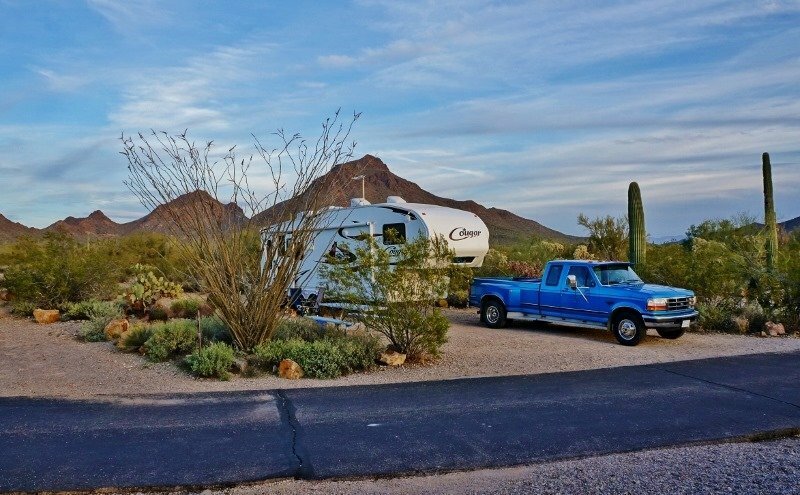 It’s like you are camping in a cactus garden with all sorts of wildlife around. Tons of birds, rabbits and even coyotes stroll through campground. Views are the draw here at Poverty Flats. 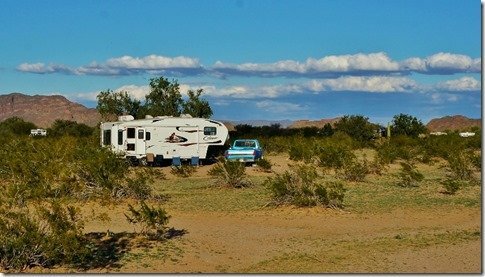 Bare bones dispersed camping on a table top mesa with 360 degree views of the canyons, mountains and valleys. 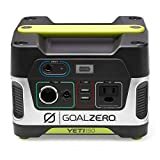 Easy to get to and big rig friendly. 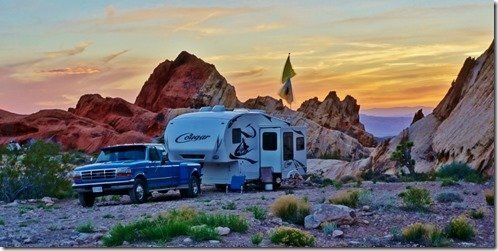 We used this spot as a free camping base to explore the Valley of Fire and Lake Mead Recreation Area. 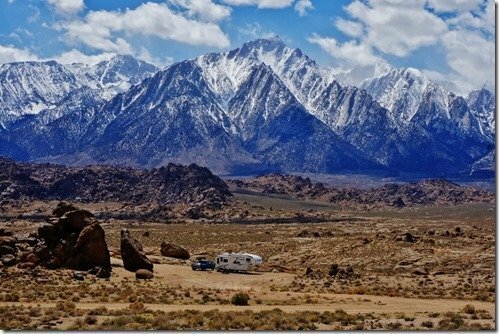 I saw this sweet little BLM camping area and vowed to return to check it out this season. Located up in the southern Nevada high country near the Arizona border. It has a unique combination of Joshua Trees and colorful sand stone formations making it one of the most photogenic and beautiful desert landscapes we visited. Our final BLM camping spot was my favorite. I was blown away by the scenery at Alabama Hills. 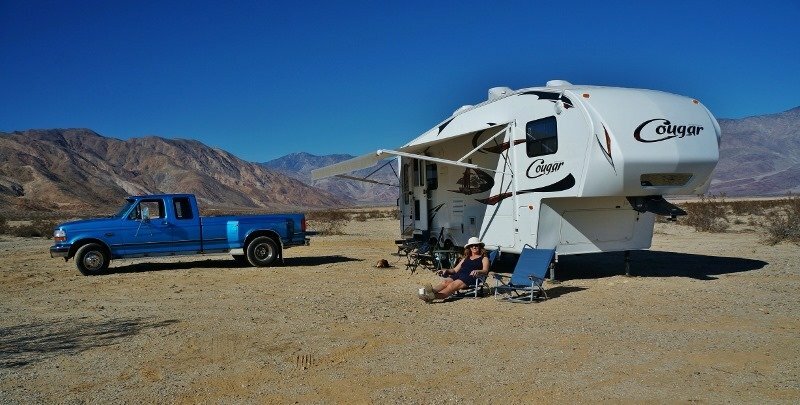 We were lucky to score one of the more private spots with an amazing view of the Sierra Nevada mountains. What a way to wind up our snowbird adventures down south! Can’t wait for next winter.